Located on the northern reef of Lhaviyani Atoll, the Kuredu Island Resort is a tropical paradise with more than 3km of pristine white beaches and glistening azure lagoons. This luxury resort treats guests to fine dining experiences, revitalising spa treatments and the Maldives' first ever golf course, all within a perfectly serene setting. Join a diving or snorkelling excursion and explore the sparkling turquoise waters. Get up close to the wonderfully diverse marine life of the Maldives, including colourful coral reefs and majestic sea turtles. Exotic thatched bungalows and spacious villas decorate the Kuredu Island Resort on both land and sea, with fresh, calming decor and modern touches for an idyllic island getaway. This peaceful paradise offers a wealth of facilities including: two freshwater swimming pools, children's wading pool, floodlit tennis court, golf course, fitness centre, entertainment centre, PADI dive centre, water sports centre, internet stations, four buffet-style restaurants, three a la carte restaurants, seven bars, tea house, ice-cream parlour, wine cellar, four gift shops, and jewellers. 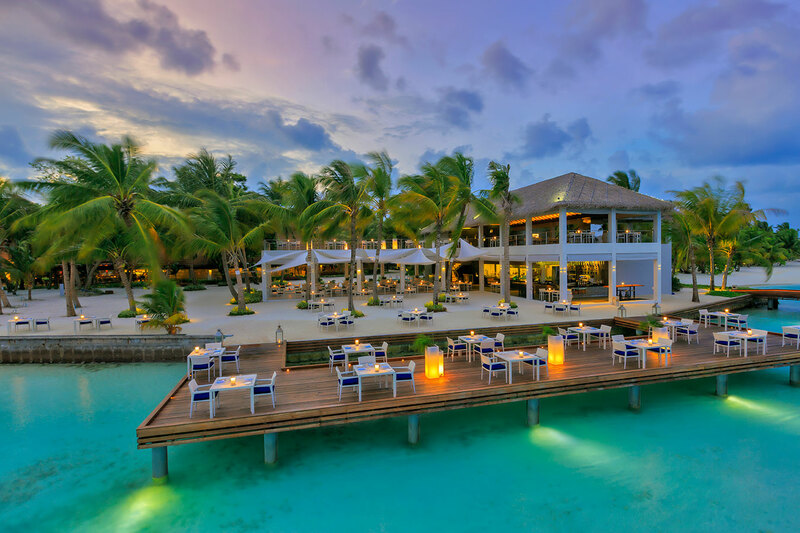 Kuredu Island Resort features four main buffet restaurants, with an array of international dishes and live cooking stations to suit all tastes. There are also three a la carte restaurants which serve delicious gourmet cuisine. The Beach is a fine dining experience with speciality fish and meat dishes, The Far East features an authentic Japanese-style menu, and Franco's serves rustic Mediterranean favourites. There are seven bars on-site which serve a wide selection of refreshing beverages and tropical cocktails. 'O' Bar features after-dinner stargazing and ocean discovery evenings and Babuna Bar has live music performances. Sai Kotari Tea House is the perfect spot to admire stunning ocean views while indulging in sweet pastries. Alternatively, cool down with a heavenly ice-cream from Island Ice. 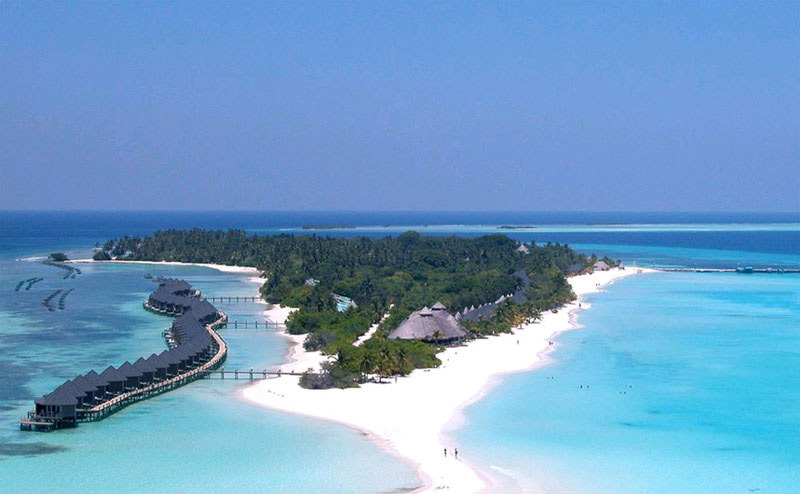 At the Kuredu Island Resort Maldives, there is a variety of sports facilities available. On-site there is a floodlit tennis court and golf course with driving range, putting green and six-hole pitch. Other activities include: badminton, beach volleyball and football. The fitness centre also features state-of-the-art equipment. The PADI dive centre caters to all experience levels for those looking to discover the exotic marine life of the Maldives or join a snorkelling session to explore the lagoon. For those looking to venture further afield, take a ocean snorkelling excursion in search of sea turtles and manta rays. Other excursions available include: fishing trips, cruises, and island hopping. There's also an entertainment centre which features: table tennis, table football, snooker, darts, and a widescreen TV. The Duniye Spa offers a range of treatments including: massages, facials, reflexology, manicure, and pedicure. The Kuredu Island Resort comprises 383 bungalows and villas, each with: bathroom with bath amenities, beach towels, furnished porch area, air-conditioning, ceiling fan, minibar, Nespresso tea and coffee making facilities, hairdryer, telephone, CD player, and safe. Guide price is per person. Based on 2 people sharing for 7 nights on Full Board. Flying from regional airports. Year round departures. All overseas transfers included.